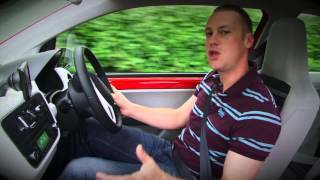 SEAT Mii 2012 is the perfect city car with length of just 3.56m. 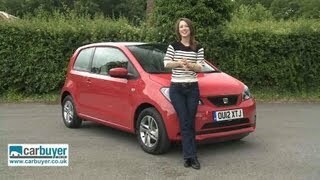 The sporty city car goes on sale this november in Spain as a two-door; the four-door version follows in spring 2012. With the Mii, SEAT is presenting the perfect automobile for the urban lifestyle of today. The Mii makes life easier – with compelling utility, exceptional driving fun, high efficiency and innovative technology. The Mii combines SEAT’s sporty Mediterranean design with the very best craftsmanship and enormous scope for individualization. Moreover, the outstanding value-for-money and reasonable maintenance costs make the joy of driving a Mii easily attainable – also typical SEAT. 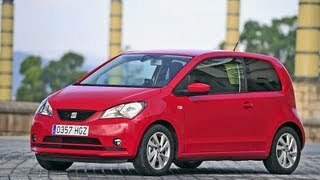 Spain, SEAT’s home market, will begin sales of Mii before the end of the year, with the rest of Europe following in Spring 2012. At a length of 3,56 meters, the Mii is the perfect size for modern-day urban spaces. The Mii comes to market at the end of 2011 as a two-door; the four-door version follows in 2012. The all-new 1.0-litre petrol engines with 44 and 55 kW (60 and 75 hp) combine with the low weight of 854 kilograms to guarantee light-footed agility and exemplary efficiency. The Mii Ecomotive has a CO2 figure of just 97 grams per kilometre. The Mii is also a leader when it comes to innovative technologies. The City Safety Assist for instance, adds an extra dimension of safety in the city, while the SEAT Portable System brings together entertainment, navigation, phone and vehicle functions in previously unheard-of fashion. Even though the Mii fits lithely into every parking space, its optimum space usage means it still offers plenty of space for four. With a volume of 251 litres the Mii offers the largest luggage compartment in its class. With the rear seat back folded, this increases to as much as 951 litres. Yet the Mii doesn’t stop at the city boundaries. Its spaciousness, excellent comfort levels and sporty dynamics – also thanks to its low weight – also make the Mii a compelling companion over longer distances. Characteristic and unmistakable – from the very first glance, the Mii is clearly recognisable as a member of the SEAT family. Its front end carries forward the typical arrow visual, while its side line is distinguished by powerful wheel arches and slender roof pillars. The rear end shows a new form of light design with triangular lamp units. The perfect proportions are a key element and are made up of the width of 1.64 metres, the long wheelbase of 2.42 metres and unusually short overhangs front and rear. The steep rear end facilitates the Mii’s exceptional spaciousness – optimal functionality is particularly important in the super-compact segment. Modern clarity and compelling functionality are defining aspects of the interior, too. The perfect ergonomics of the instruments and the control elements fit beautifully with the premium surfaces that can be individualized using coloured trim from the various equipment lines. Its seats are also new – with integrated head restraints, they possess sports car flair, while being very comfortable and well-suited to long-distance driving. A unique innovation in this class of vehicle is the City Safety Assist – in the event of danger, the Mii warns its driver or even brakes automatically. A laser sensor recognizes other vehicles in front, whether they are driving or stationery. The system warns the driver under threat of an accident at less than 30 km/h. 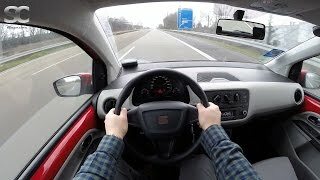 If he/she does not react, the Mii brakes autonomously. In many situations this is sufficient to avoid an accident altogether and will, at the very least, mitigate its consequences. A perfectly matched ESP system is also available and is always combined with City Safety Assist when specified. Systematic lightweight design means that the base weight of the Mii is only 854 kilograms. Its bodyshell is a piece of hi-tech, formed largely from high-strength and, in places, form-hardened steels. Thanks to exceptional stiffness, it delivers a high-quality feel and excellent passive safety. The side airbags are standard equipment and are particularly large for optimum protection of head and upper body. Beneath the short bonnet of the Mii is a completely new generation of engines. The compact three-cylinder with a one-litre displacement is very light, compact and smooth-running. With two outputs of 44 and 55 kW (60 and 75 hp), it ensures light-footed agility and compelling dynamics, and not just in city traffic. Due to its top speed of 160 and 171 km/h, its fuel consumption is just 4.5 and 4.7 litres per 100 kilometres. With a 35-litre tank volume, it offers generous range and long-lasting driving fun – at very low maintenance costs. The most notable efficiency experts are the two Ecomotive versions of the Mii. Thanks to a start/stop system, recuperation and further consumption-lowering initiatives, they make do with just 4.2 litres, which equates to a CO2 figure of just 97 grams/km. The little SEAT with the later available CNG drive emits a mere 86 grams of CO2/km, making the Mii one of the cleanest cars in the world. As an alternative to a manual transmission, the Mii is also available with an automated manual box, with two electric motors managing the smooth gear change. SEAT is a young brand – the unique SEAT Portable System is, of course, part of that. The innovative solution with a 5-inch screen is removable for mobile use and yet perfectly integrated into the vehicle electronics. Its many functions include the navigation system, the hands-free phone system with voice control and an on-board computer. The PID can be combined with the integrated radio and speaker system. The unique functions of the SEAT Portable System include the Eco-trainer. Shift display, engine speed recommendations, average values and consumption profile all help the Mii owner to drive particularly economically. Plus, the SEAT Portable System is fully integrated into the vehicle electronics. It can be kept up-to-date via internet download, while tailor-made apps will offer additional functions in future. With three equipment lines, two Style Packs and a wide array of optional equipment and accessories, the Mii can be adapted perfectly to suit individual lifestyles and preferences. Even the base model has all the key elements for safety and urban driving fun, such as ABS, an adjustable steering column, side airbags and Isofix points with Top Tether. Reference and Style are the names of the two other equipment lines, with Style offering features like power windows and central locking. Would you prefer more chic or more sporting character in your Mii? The two equipment packages Chic and Sport offer the choice, with special colour and trim elements for interior individualization. Alloy wheels and a leather steering wheel are always part of the package - the chrome package in the Chic version adds a special touch, while the Sport version offers tinted windows and a sporty suspension setup for an even more dynamic feel. SEATis the only company in its sector with the full-range capacity to design, develop, manufacture and market cars in Spain. A member of the Volkswagen Group, the multinational has its headquarters in Martorell (Barcelona), exporting approximately 75% of its production to 72 countries. SEAT is the market leader in Spain, and in 2010 reached a turnover amounting to 4.7 billion Euros, with total sales of 339,500 vehicles. The Spanish multinational also has a Technical Center, a ‘knowledge hub’ bringing together more than 900 engineers whose goal is to be the driving force behind innovation for the number one industrial investor in R&D+i in Spain. In line with its declared commitment to environmental protection, SEAT undertakes and bases its core activity on sustainability, namely reduction of CO2 emissions, energy efficiency, as well as recycling and re-using of resources.